Five ATMs are located at the Festival: Two inside the front gate next to the Information booth, one by our First Aid Building, and two next to the King's Food Court. Visa and MasterCard are accepted at our Ticket Booth. We no longer accept Discover and American Express. Most craft shops accept all major credit cards. Changing facilities are located next to the privies (restrooms). Available at the Bellrose Shoppe, located just outside the Front Gate. 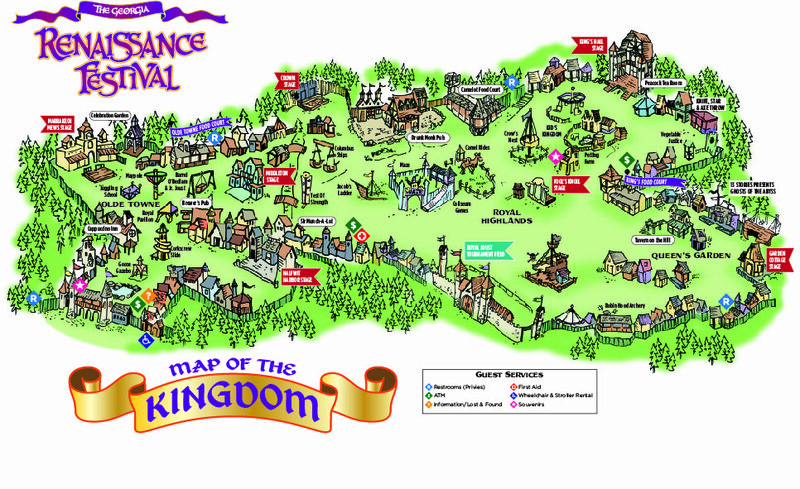 Festival Programs are available as you enter the Front Gate, at the King's Food Court, and at the Information booth. First Aid care is available in the Royal Highlands Area near the Joust Arena. The Celebration Garden is available for your special event. For more information go to the Weddings page or call (770) 964-8575. We can help organize your large corporate picnic or group party in our private, 3-acre wooded picnic area. For more information go to the Corporate and Private Events page or call (770) 964-8575. Corporate events, birthday and holiday parties are going Renaissance! Make your event the talk of your village with Renaissance performers. We can provide an outstanding variety of jugglers, stilt walkers, musicians, and colorfully-costumed characters to give your party that unique Renaissance flavor. For more information, please contact our office at (770) 964-8575.